A strong healthcare industry is essential to the health and economic vitality of the region. The four hospitals/healthcare systems and multiple healthcare providers in the Region 9 geographic area may naturally compete for similar patient populations, but can collaborate to improve the sector for their respective communities. By bringing together a local group of representatives to sit at a “single table”, and identify multiple issues and/or priorities, we will develop solutions that improve the healthcare landscape. Many factors impact the delivery of high quality healthcare: an educated healthcare workforce; changing state funding priorities; fragmented systems of care that lead to duplication; social determinants of health; and changing payment models. By working together and engaging educational and community partners, we can increase economies of scale and develop a stronger voice to drive change and improve health for our region. The partnership provides an avenue to create change, a place to come together to discuss urgent issues, and a channel to ensure that all agencies are informed of how they may be impacted. 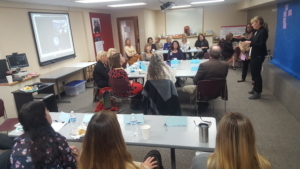 SPA facilitates quarterly calls to bring together healthcare industry leaders and community partners at a single table to address multiple issues encompassing our local communities. Topics provide a unified voice on policy matters that affect the healthcare sector in Southwest Colorado as an avenue to create change. Becoming a member of the partnership demonstrates community engagement and will be a part of a common group to develop a stronger voice to drive change and improve health for our region. For more information and/or become a member of the Partnership, contact Christina Crain at christina.crain@swcahec.org. Next quarterly call is scheduled for Wednesday, June 19, 2019.